Home > Health Issues > More Health Conditions > Epilepsy & Seizures > PetAlive EaseSure-S - Herbal Support for Pets with Seizures - 2 oz. EaseSure-S is an herbal formula for long term support for pets with seizures. EaseSure-S is used to soothe the nervous system in dogs and cats. EaseSure-S contains herbal ingredients specially selected to help cats and dogs with seizures. It may be used to maintain normal electrical balance in the brain. EaseSure-S is especially helpful for managing stress-induced episodes such as trips to the vet, changes in routine, new family members or even thunderstorms. EaseSure-S drops may be used on their own or in a supportive capacity with conventional medication. 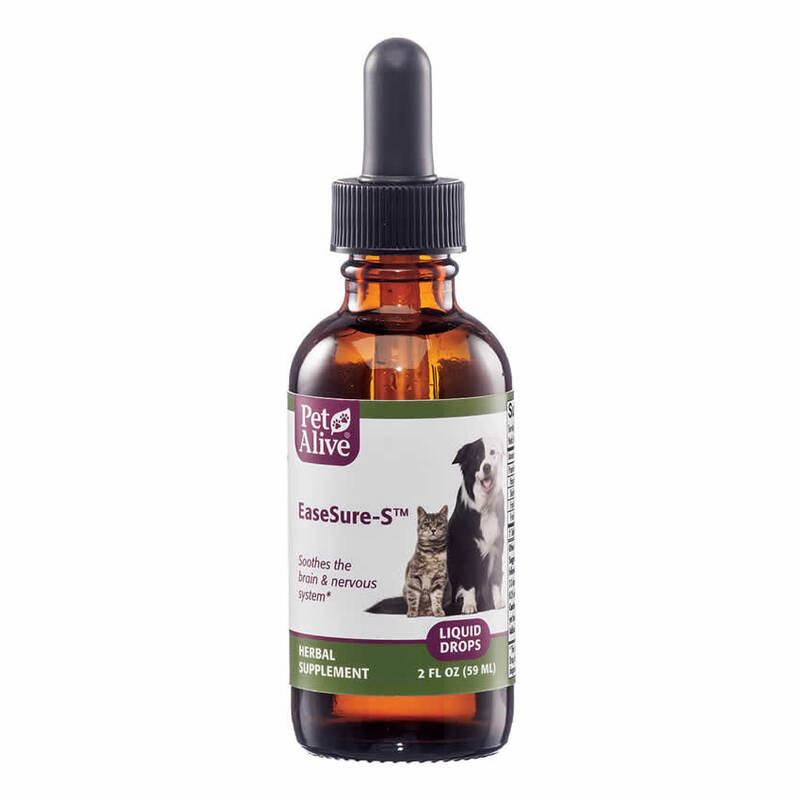 Herbal EaseSure-S is a great complementary remedy to EaseSure-M, a homeopathic medicine by PetAlive. EaseSure-M temporarily provides a quieting, sedative effect on the nervous system and reduces hypersensitivity, tiredness, weakness, trembling and sensitivity to noise. Our young cat had severe seizures - like something out of The Excorcist. We began treating her with this product and altering her diet. The seizures have gone and have stayed away. I don't know if this product is responsible in full or part but we'll keep using it to be sure. I have been using this product for 6 years with my 11 year old golden retriever who began having seizures at the age of 5. I did not want to put him on the pharmaceutical that the vet suggested so did my own research on a natural alternatives. Came across this product and it is amazing to say the least!!!! I give him 8-10 drops on a treat morning and night. The first year he was on it, his seizures reduced from about 5-6 a year, to 1-2 a year. As of now, he has not had a single seizure in about 4 years!! I could not be happier with this product. You must be religious about giving it twice a day! Love, love it!!!! When my 15 year old cat first started having seizures they were few and far between. Last fall the seizures became more frequent happening 3-6 times per week. Some of them were quite severe with him thrashing about on the floor, running through the house banging against walls/doors, etc. 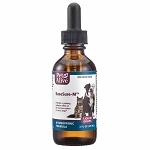 I started with the EaseSure at the lowest dosage of two drops twice a day for a cat under 10 pounds. I increased incrementally as the seizures continued. I currently give him four drops three times a day. The seizures have not lessened in frequency but they have definitely lessened in severity. Most of his seizures he has now you wouldn't even notice (unless your his mom and are watching him 24/7). They only last about 10-15 seconds and usually they are no more than a turning/twisting of his head and body. If he is upright at the time it just looks like he is a newborn doe just learning to walk and he falls over slowly on his wobbly legs. There have only been two severe seizures since October. I still get anxious every time he has a seizure but I worry about leaving him home alone a bit less knowing that if he has one in my absence it will probably pass very quickly and with no harm to him. That is a huge weight lifted off a mother's shoulders. We tried three, prescription, anti-seizure meds before trying EaseSure but my cat had a bad reaction to all of them. This supplement was a last resort and it has been surprisingly helpful. My baby is suffering less and so am I. Passion flower (Passiflora incarnata) is an herb used to soothe the nerves and support the routine equilibrium of the nervous system. The active ingredients in this herb include flavonoids, cyanogenic glycosides, alkaloids and saparin. Passiflora has also stood up well to clinical studies which support its traditional usage as a soothing and moderating herb. Skullcap (Scuttelaria laterifolia) is an herbal tonic that has been traditionally used to ease non-debilitating feelings of being 'overwhelmed'. Fresh wild oat (Avena sativa) is an herb that acts as a general nerve tonic, calming the nerves when necessary, stimulating their activity when needed. Ashwagandha is an herb shown to have neuroprotective and antioxidant properties in disorders affecting the nervous system. Mix drops with water and administer (squirt or spoon) directly into the back of the mouth. Repeat after 5 minutes if needed (up to 2 doses). One 2 oz. (60 ml.) bottle of EaseSure will last for approximately 80 days, depending on the size and needs of your pet. For more information, visit our webpage Seizures and Epilepsy in Pets.